Joan Hiatt Harlow is an internationally known writer for children. Her acclaimed books, magazines stories, and articles have appeared in major children's publications throughout North America, Europe, New Zealand, and Australia. 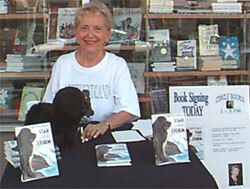 Joan Hiatt Harlow is available for talks and book signings at book stores, libraries, schools, and civic events. I hope you'll enjoy browsing here where you can see the books I've written, as well as the books I'm about to write. I was born and grew up in New England. You'll find a taste of Boston and Maine seashores in JOSHUA'S SONG and SHADOWS ON THE SEA. My mother was a Newfoundlander, and you'll read about the "Beautiful Rock" in STAR IN THE STORM, THUNDER FROM THE SEA, and SECRET OF THE NIGHT PONIES. My dad was a well-known singer in New England. Music was an important part of my life, and in JOSHUA'S SONG and SHADOWS on the SEA you'll find characters who have a strong love of music. I really did see the Florida panther - near my own back yard in Venice, Florida. That’s where I got the idea for a panther in DARK SIDE OF THE CREEK and BLOWN AWAY! And the friendly bats in THE MYSTERIOUS DR. CHEN often visited us at our cottage on Lake Winnipesaukee, New Hampshire. Can you see how bits and pieces of my own life are woven into my stories? Folks ask, "When did you first decide to become a writer?" My answer: "As soon as I learned to read - which was at the age of four." I discovered, though, that writing is a craft - it isn't just weaving a good story.